If you say “The Galapagos”, I instantly think of glittering blue sea, sunbathing sea lions and animals abound. Upon arrival on San Cristobal island, I was not to be disappointed. As I drove from the airport to my accommodation, I saw sea lions lounging on the beach in the sun whilst not far off there were tourists also enjoying doing the same. Out at sea, I saw a cloud of birds on the horizon, dipping and diving into the surf. On land, I saw scraggy undergrowth clinging to volcanic rock formations. I was instantly hooked. 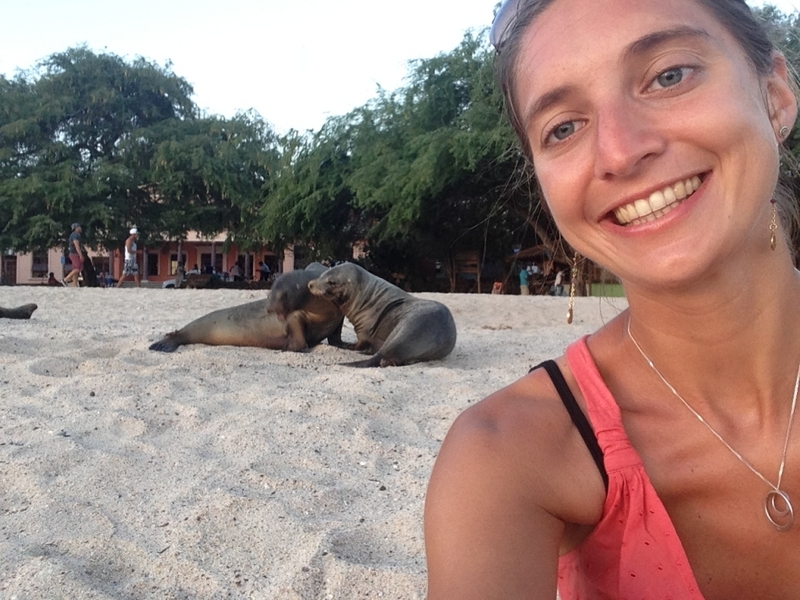 I was on the Galapagos to visit two conservation volunteering projects- but before I joined them, I had some time to explore – and boy did I make the most of it. I stayed in the main town on San Cristobal of Puerto Baquerizo Moreno, which is close to some stunning beaches and great walks. There are so many lovely coves that you can access by foot from here where you can do some amazing snorkelling and swim in crystal clear waters. The main highlight for me however was doing a day trip. I did a boat trip around the entire island, which lasted for a full day, stopping off in all of the areas that the National Park allows visitors to. This started off with going past a rocky island positively full to bursting of some amazing birds called boobies – they have a beautiful mating dance and are incredible to see. 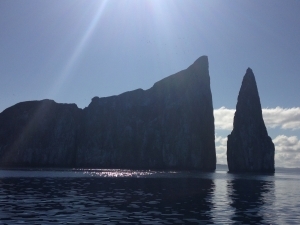 After this our boat took us out to Kicker Rock, one of the most famous dive sites in the area. Here we all donned our snorkel gear, hopped off the boat and explored the amazing marine life living there. We were able to swim in and out of the rock formations, surrounded at times by clouds of fish, rays and even – so exciting! – Galapagos sharks. It was absolutely breathtaking and one of the most incredible snorkel experiences of my life. After this, we headed off further around the island and stopped off in the flow of an ancient volcano. Here we walked up onto the lava flow, from where we had wonderful views out over the landscape and the sea. We reached a point where you could actually climb inside the lava formations, which was amazing. Our trip continued onwards past some dazzlingly beautiful beaches, one of which we stopped at for a tasty lunch of rice and fish. 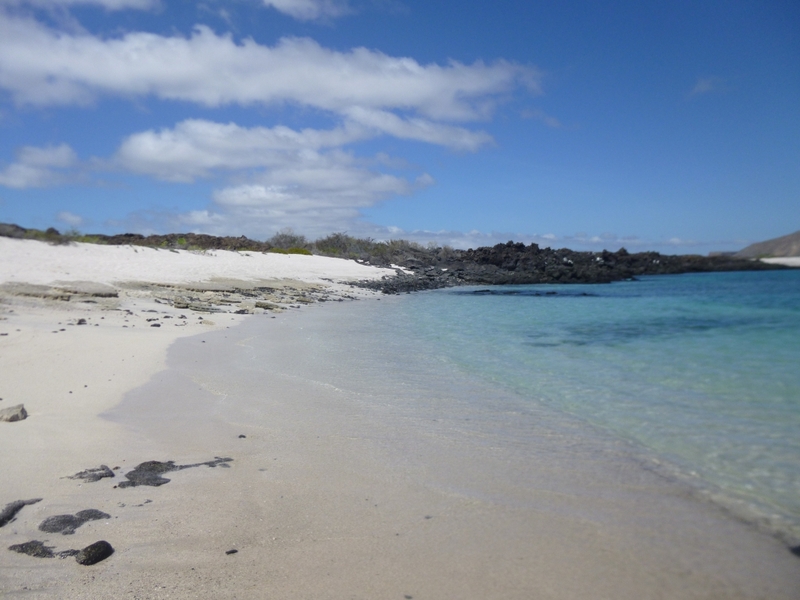 We then donned our snorkel gear again and snorkeled in a natural sea lagoon, bursting with Galapagos sharks. It was really quite breathtaking. Slightly further on from here, we snorkelled with turtles – a lifelong dream! I was so pleased to see some of this marine life in such abundance, as I have never experienced anything so wonderful before. I was so pleased to have done this trip, as it was possibly one of the best ways that I could have experienced the Galapagos. In the evening we went to the beach to watch the sun set, and there we saw huge clumps of large iguanas basking in the setting sun. It was an amazing sight at the end of an amazing day. 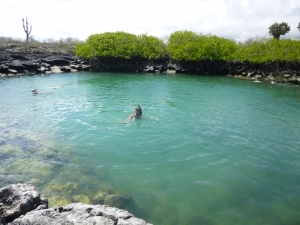 To find out more about the conservation project in the Galapagos, check out our conservation volunteering page.